July 12 was not the easiest of days, but Sylvain L. managed to complete his declared task, flying the club's LS4 305 kms in 5h28m from Kars to Beaudette bridge, to Athens and returning home. A claim by the Official Observer (Tim) was filed with the SAC badge chairman and approved this week. Congratulations Sylvain. 1st solo - Paul S.
Congratulations to Paul S. who made his 1st solo glider flight on Sunday. on 25 March 2014 . The Soaring Association of Canada has given the 2013 Wlater Piercy award to George for Canadian Instructor of the Year. Here is what SAC says about the award. The Walter Piercy Award was presented to the Association in 1964 by Walter Piercy, past chairman of the Instructors committee, to be awarded to an instructor who contributes to an outstanding year to his club. This award is won essentially for achieving the most instructing flights in the club in the year, adjusted for numbers of instructors in the club and numbers of instructing flights in the club. Contributions such as organization of cross country courses, ground school lectures, club offices held, and other club positions such as being in charge of aircraft maintenance also count toward this trophy. Club CFIs submit names annually to the Flight Training & Safety committee who select the winner. Everyone at Rideau Valley Soaring is very proud of George for earning this award. Congratulations George. From two separate flights, Carl earned his FAI Silver badge this season at RVSS. One flight qualified for distance and height-gain, the other for duration. The performances were recognized in the Fall 2013 edition of Free Flight magazine. This is a significant achievement for Carl and for the club, which has not minted a new Silver pilot for probably over 15 years. The FAI can take part of the blame/credit for this. Rules for Silver and Gold badges were recently changed, finally accepting GPS altitude from selective, inexpensive Flight Recorders - with an error margin - to be part of the claim. We have wrapped up another successful season of training. A number of student pilots progressed to Solo status or went further and passed their practical flight tests. Congratulations to them all, and to the volunteer instructors who showed them the way. Al H. took an end-of-season flight test and passed. Long time in the works. Welcome to the next step Al. There is a lot more work ahead. Fiona earned her solo wings on Saturday, joining Carter and Nikyla from earlier in the weeks. Congrats to all. Congrats to Carter M & Nikyla T who each passed their flight tests this week. Solo is a great way to fly! 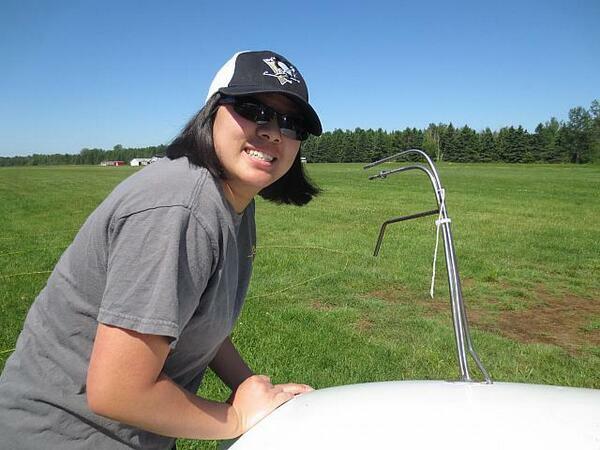 Bailey W passed her Glider Pilots License flight test last Sunday. Starting from zero on June 27, she has done very well. Congrats. Congratulations to Kyle B on passing his Glider Pilot License flight test under very windy conditions. ” Flying with the CHAMPIONS ” also from Bitterwasser this year! Heroes or ” madmen” ?? Wishing you a HAPPY, HEALTHY and above all SAFE 2015. MILVUS… functional clothes specially designed for gliding! High speed rides! What about 189.5 km./h. over 429.3 km. in an ASG 29!!!!! Goonidiwindi;Aboriginal name for “resting place of the birds”. Lights out! Spot on! The flying musicians from Stoelln!